The next installment in The Met: Live in HD series will be a revival of Lucia di Lammermoor, Gaetano Donizetti’s dramatic version of Sir Walter Scott’s novel. Since its premiere in 1835, Lucia has been a favorite of audiences and performers and has a secure spot in the core repertoire. Its sextet and the heroine’s mad scene are among the most popular moments in opera. Anna Netrebko stars as Lucia, with Mariusz Kwiecien as her brother Enrico. Rolando Villazón had been scheduled to appear as Lucia’s lover Edgardo, but Villazón has become ill, and will be replaced by Polish tenor Piotr Beczala. Director Mary Zimmerman moves the era to the mid-19th century, and her production emphasizes the element of gothic horror in the story. Marco Armiliato conducts the performance. 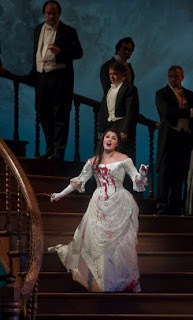 The live transmission of Lucia di Lammermoor will be on Saturday, February 7, starting at 1:00 pm (ET), with an encore broadcast on Wednesday, February 18, at 7:00 pm (local time). Check your local theater listings for details or check out the Met’s website.